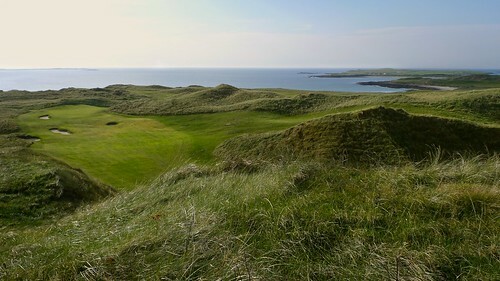 After playing Carne twice last fall, I wanted to share my thoughts on the recent and brilliant expansion at Carne Golf Links at Belmullet. The new work was a collaboration over time and space between Jim Engh, Ally McIntosh, and Eamon Mangan. The new nine departs from the original clubhouse, the tee shot's challenge like a dry thread through a needle. The first fairway is not wide, and largely blind, hidden beyond the crest of a hill. The line fits tightly between Hackett's number 10 and 1 fairways. It's tempting to criticize the extremely compacted departure area. There's plenty to pin a weak tee shot on--and an audience in the gallery in the elevated clubhouse bar to boot. Beyond the crown of the hill, the crowded club vanishes. The fairway narrows and rolls toward a choke point studded by two large swales of shaggy tallgrass, each almost as large as the green itself. The green features a dune backing, a necessary echo of Hackett's original route. A dramatic par three, which plays more easily than the look might suggest. The look is daunting: an array of tees cut into a pyramidal dune offer a variety of lines to a generous punchbowl green. Between the tee and green is a swirling chasm of tall grasses and rippling dune sand, each pushed by the Atlantic winds at their own pace. A steepled dune on the right protects some pin placements from a direct line with an iron, forcing a sort of dogleg via putter. In a way it plays like a version of Hackett's 11 in miniature, with the dune hill forcing a dogleg right. There is an allowance of room to the right to run it up to the green, and a generous slope at the rear, although this is not visible from our tee. Walking onto the green, the other side of the shielding dune is blown out, a towering fifty foot wall of sand clinging to the angle of repose. The foot of the dune sports a trap rake, so we can assume it's not a waste area. If you do get stuck up there, it seems like a shame to leave footprints in such a perfect product of wind and gravity. Next is the first of three par fours in the nine, each playing on the theme of deception. From the tee, we see that the fairway runs down and to the right and is likely short. The longer tees are pushed to the left, forcing a more challenging carry. Accurate shots set off running, making for the center well of the fairway, where we can peek through a zig-zag of dunes to the green. A big drive can get long of the fairway and hang in high grasses. Drives that drift too far left make an approach more challenging. Drives to the right will stall in steep hillside lies. This green exhibits more whaleback characteristics than the surrounding Hackett greens. This green spends much of the afternoon in the shadow of the same hill dune that makes the dogleg 11th on Hackett. I'm guessing this hole will benefit the most from green maturation and hazard adjustments. After crossing the Hackett course routing via the 17th driving zone, the majesty of what is now perhaps the most beautiful fairway at the club presents itself. A narrow valley floor is faced on both sides by a vertical dune walls and swales: a grand canyon of Irish green. It's a truly amazing view--one seen in glimpses by players on the Hackett routing for years. Sunlight pours down the valley in the late afternoon and shadows carve the roiling fairway. As an aside, visitors to the Hackett 17 tee will see what looks like it could become an extremely challenging pro tee for Kilmore 5. Cut into a neighboring dune wall, and facing the valley, but a good fifty yards back and picking up another 75 feet of elevation, it doesn't feel like an everyday placement. Perhaps since it was roped as ground-under-repair the committee had second thoughts. Returning the primary tees, the fairway is generous and an accurate ball can carry the waves of the fairway, dropping elevation a bit, before resting by an isolated dune that towers over the fairway floor like a ziggurat. A saddlebacked hillside of mown rough runs to the right. More inviting fairway runs around the dune far to the left. 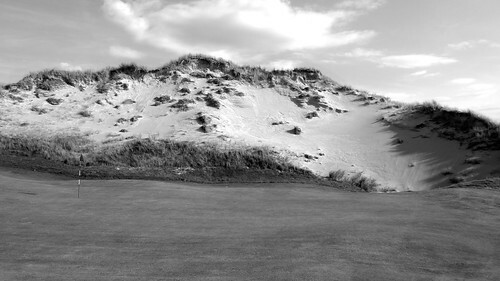 The riskiest approach is to split the shot, carry the dune fully, and run up to the green in two. The safer shot is to pop right to a short iron approach, probably from rough. The safest play is two long irons around the left. It's a great puzzle to solve, forcing a golfer to soberly assess their own game and the conditions of the day. Whatever means, the walk to your third stroke is rewarded by a stunning view of the green, sheep fields, and finally the North Atlantic. Six turns away from the ocean, and aims back toward the clubhouse. 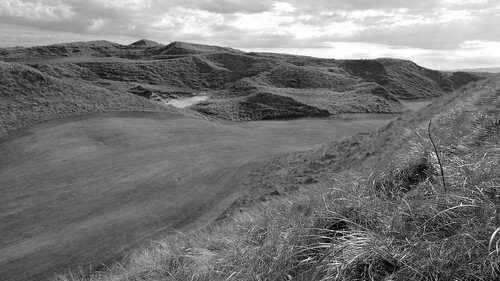 Long tees carry a meadow and then begin a significant climb to a fairway guarded on the left by a cliff-edge and guarded on the right by OB, marked by a barbed wire property line. All of this makes the hole play far longer than you might expect. From here a blind iron gets you to a crowned green with a westerly view of the linksland and cleared pastures. This approach can engage the prevailing winds in a complex way, as will the following holes. It's easy to fly the green on this shot. It's a few steps to the next tee box, which stretches along a promontory high above the No 5. fairway. The northern view here is almost certainly the best on the property; camera time. The view to the green is less welcoming: farther along the crest of the dunes, a distant pin with very little fairway, cradled between two dunes. The back tees must carry the canyon below and don't enjoy much elevation advantage. Too far left will likely drop a sixty feet or more out of play. Right will get hung up in the leeward grasses. Holing out on here returns you more or less near the no 5. tee, just a good 150 feet above. Tough three. A par four that continues to hammer the deception motif. Required off the tee is a blind approach to a juking, zig-zag fairway that keeps you guessing. A drive uphill and along the gently sloped dune walls reveals a distant green complex sitting up on a shelf. The hole plays like a mirror image Hackett's brilliant number 17. Players who know Bandon Dunes original course might see it as a cousin of Kidd's number 7. With an ideal lie, the green is a tempting target for a regulation approach. Any miss gets in trouble, falling into large hollows to the left and in front of the green. Whatever the result, a long walk uphill to a final summit awaits. By necessity, number nine echoes Hackett's closer, covering similar terrain and perhaps straining to return players to the clubhouse along a similar route. Unlike Hackett's 18, here the return is a par four, and the zig-zag effect again appears, in a crescendo. A deeply carved valley fairway seems to take pleasure in limiting most second shots. Yes, the tee is elevated, yet most drives get stuck short. Once the deep offset of hills is cleared, we gain elevation to a green suited for a hand shake and a brief walk to the locker room. 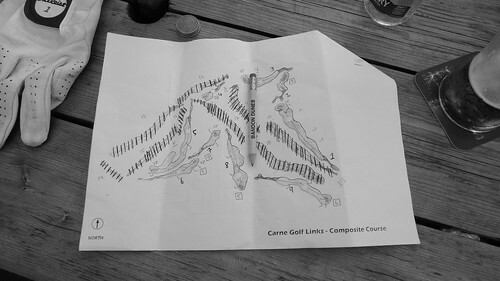 In years past, eighteen holes at Carne never felt like enough. Given the time and care put into this elaboration, it is not surprising that the nine pairs well with Hackett's original legend. Like the variations on a story told many times, the new 9 stays loyal to the original plot while presenting its own quirks and complications. At times it may overuse structural challenges, and doesn't perfectly integrate into the original's routing. There are a couple of awkward crossings where the dunes can feel crowded. The land it covers is so breathtaking it's a surprise it wasn't exploited in Hackett's original. Taken as a whole, there is a great three-act structure across these 27 holes, no matter the order.